The Korg MicroKORG: Don't Call it "Cute"
What do Dr. Dre, Beck, LCD Soundsystem, The Killers, Death Cab for Cutie, and Kings of Leon have in common? Answer: They all use a microKORG. Everything about this fat-sounding analog-modeling synth screams "future classic," from its on-board vocoder, to its tiny footprint and retro-style wood case. Chances are, you'll be seeing (and hearing) more and more of this unassuming little monster, so let's take a look at what the Korg microKORG has to offer to indie bands, hip-hop producers, and electronica artists. First things first: if you're primarily a piano player, the microKORG's 37 mini-keys may take some getting used to. It's designed to be played one-handed, which means your other hand is free to manipulate the Pitch Bend wheel, Modulation wheel, and five fat knobs. To get started, choose one of 112 preset programs in seven categories: Trance, Techno/House, Electronica, Drum'n'Bass/Breaks, Hip-Hop/Vintage, Retro, and Sound Effects/Hits. You'll find that just about every synth sound you can dream up is represented here. Play the keyboard as you twist the knobs that control filter cutoff, resonance, envelope attack and release times, and arpeggiator tempo. Ready to start making your own synth sounds? Start with an oscillator algorithm (such as sawtooth or square wave) and turn the knobs to edit your sound, then save your work in one of the banks. You can assign the five knobs to control any parameter in real time -- just read their many functions written on the front panel. It's an excellent intro to the world of synthesis, and with no LCD screen to squint at, you'll forget you're dealing with a powerful DSP computer and start having some analog-style fun. The included manual's Quick Start guide will have you squeezing big sounds out of this little board in no time. 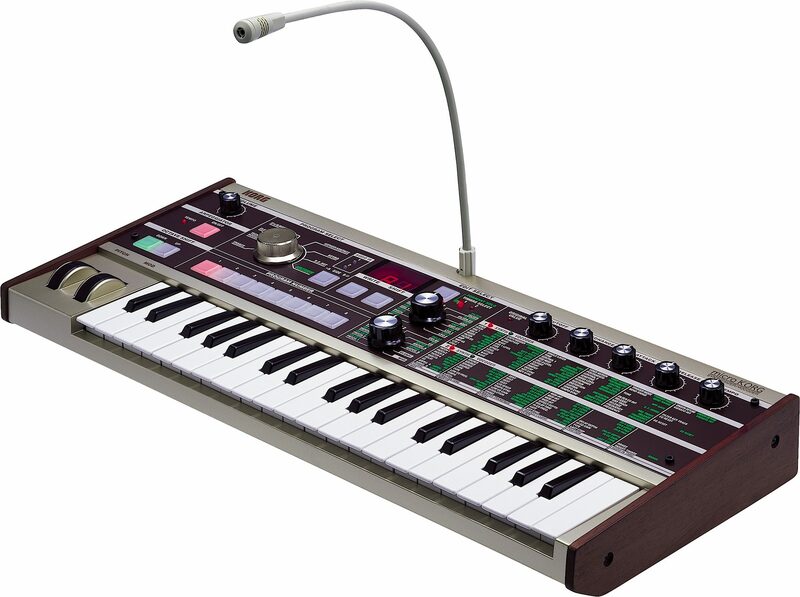 No doubt you've noticed the nifty condenser microphone that Korg has thoughtfully included, connected to the microKORG. And you couldn't really miss the big green "VOCODER" setting on the Program Select dial, either. That's right, the microKORG has a vocoder with a built-in mic, so you can process the signal produced by the microKORG in real time through one of the most dynamic filters on the planet: the human voice. Shift, stretch and distort your voice with this powerful processor. Could your latest composition use a little bit more robot from outer space? How about a fat chipmunk in an echo chamber? Try all 16 of the included vocoder programs, or write your own vocoder program to the microKORG's memory and play it by pressing the keys, even when you're not vocalizing. Best of all, you can plug in any mic you like on a cord of any length, so you're not limited to standing in front of the microKORG when you vocalize into its vocoder on stage. The microKORG's dual arpeggiator spreads out and repeats the notes of any chord you play in a looping pattern at any tempo you specify -- a useful tool for making beats, or turning a simple one-handed bass-line into something much richer. Choose from six built-in arpeggiator programs or build your own pattern, then adjust the knobs to control the length, spacing, and swing of the notes. You can set the arpeggiator to turn off automatically when you take your hand off the keyboard, or continue playing without you, and you can set it to play either of two timbres in your current synth program. Overall, it's a powerful and flexible tool that doesn't just sound cool, it provides a solid foundation to build entire songs. You don't have to have mad keyboard skills to make great sounds -- just turn on the arpeggiator and get inspired! "Analog" as it may seem, the microKORG is a digital instrument, and it's fully MIDI-compatible. Have a full-size keyboard that you want to use to play the microKORG's sounds? Connect the MIDI OUT of your external keyboard to the microKORG's MIDI IN, and you're off to the races. Or use the microKORG to play MIDI data into your DAW's sequencer. Every control on the microKORG can transmit MIDI information if you so desire. 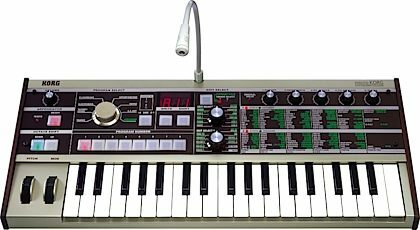 At just five pounds, the microKORG can squeeze into the tightest of studio setups, yet its big analog-synth sounds are likely to fatten up just about any kind of music. You'll find the microKORG fun and easy to use, no matter your level of keyboard skill. Just be careful not to call it "cute!" Sound: This keyboard can make just about any synth sound you'd want it to make. Obviously it doesn't have anything like piano but that isn't what this keyboard is designed to do. It does, however have a pretty good electric piano imitation. Some of the bass sounds that come out of it are absolutely ENORMOUS and are ridiculous coming out of such a small package. All in all, it sounds GREAT. Feature: The vocoder with included mic is an awesome feature! The vocoder sounds so cool and is a great addition to the right tracks. Also, the keyboard has a lot of settings that can be changed, but it also has a light that lights up to let you know when you've set the setting you're changing back to its original value. Very helpful. Ease of Use: At first, all the knobs and the huge list of parameters can seem very overwhelming but it doesn't take long at all to figure how they work and how you can begin customizing your own sounds from the presets. The small keyboard doesn't impede the playability at all, in fact it makes it easier sometimes, and if you want more keys you can always use a MIDI controller which is very easy to attach. Quality: While it is made of mostly plastic, it seems to be very tough for being plastic. If you put it in a nice case or bag, it seems very secure and I would not worry at all about it breaking. It seems like it would last for a very long time. Value: For the price this is an amazing little synthesizer -- it looks and sounds a lot more expensive than it is. The Wow Factor: Every time someone sees my Korg, they ooh and ahh about how "cute" it is, and then when they hear it they're like "WOAH I WANT ONE." Also, the wood paneling and olive color give it a very cool retro feel. The size of the keyboard is awesome, too, it makes it extremely easy and convenient to transport. Overall: If I lost this keyboard or somebody stole it I would cry! I would DEFINITELY purchase a new one. This keyboard makes the most amazing synth sounds and is SO FREAKING PORTABLE. You couldn't find a better keyboard that is easier to carry around, it weighs practically nothing and takes up no room, but it sounds fantastic. 69 of 72 people (95.83%) found this review helpful. Did you? "This synthesizer is a BEAST!" Sound: The sound on this little honey can BLOW YOUR MIND!!! Deep rich bass, or out of this world spacy leads, you will LOVE these sounds guaranteed ! Feature: The features are what you would expect on a full size synth. I like to hook my guitar to the line in, and use the vocoder as a spacey breath trigger. It even has some awesome built in effects like a flanger and delay. Ease of Use: I wont lie, there is a learning curve, especcialy with the matrix list on the far right, but once you understand it, it can only get easier to understand and work with. Quality: Left and right panels are made of real wood! That I love! But... The whole unit is made of plastic, and that kind of bugs me because its so fragile. Keep it in a case, and it should last you years to come. Value: What I love about the Value it that zZounds is that they gave me the LOWEST PRICE on this baby!! Guitar Center was selling theirs for 389.00, zZ gave it to me for 379.00!!! Manufacturer Support: I haven't had any problems with it yet but once I do I'll be sure to contact them and see how they are. The Wow Factor: This synth overall is just plain AMAZING!!! If someone broke into my house and stole it from me, I would grab a shot gun and go on a man hunt. This synthesizer is just so cool, its almost exactly like the Korg MS2000, except smaller and with a few missing features, but all in all this is THE Synth to get if you are just starting out or if you need something for on the go or if you just want something to make a lot of noise in the house. JUST GET IT!!!! (I chose this over the Microkorg XL because I felt that this has a better user interface and sound than the other. The XL is great, but this had the sounds that I was looking for.) Overall: This little wonder can do it all. EVERYONE SHOULD HAVE ONE!!! Style of Music: Ska, Electronica, Classic Rock, Punk, Alternative/Progressive rock.